Augustus was born about 1828 in New York. He enlisted as a Private in Company A, 129th Indiana Regiment on 10 January 1864 and mustered out on 20 September 1865. He started receiving his pension on 30 April 1878. In 1889 he lived in Glyndon and in 1890 he lived in Moorhead. Augustus died in Washington. James was born in March 1843. Although he is listed in the rolls his enlistment is not clear. In the 1890 Veterans Schedule he is living in Moorhead and although the writing is not good, it appears he told them he enlisted as a Private in Company A, 134th Pennsylvania Infantry and he did not provide dates. This writer suspects that James is the soldier who enlisted in Company A, 14th Pennsylvania Regiment. He was enlisted for twelve days (16 September to 28 September 1862) and is probably why the 1890 census did not have dates. Records through census reports show he lived in Moorhead 1890 through 1930. He died in Moorhead on 20 July 1931. He is buried in Prairie Home Cemetery in Moorhead. Burial, Tombstone Picture. Rodliff was born in July 1840 in Maryland or New York. He enlisted as a Private in Company A, 1st Battalion Nevada Cavalry on 3 August 1861 and was mustered out on 2 July 1865 as a Corporal. Rodliff moved around quite often; 1880 Stutsman County, North Dakota; 1888 Minneapolis; 1889 Superior, Wisconsin; 1895 and 1900 Otter Tail County; but he lived in Felton in 1890. In 1882 he was the Postmaster in Saratoga, LaMoure County, North Dakota. Rodliff died in Perham, Otter Tail County in November 1909 and was buried there on 29 November 1909; cemetery unknown. Walter was born about 1842. He enlisted at Coldwater, Michigan in Company H, 9th Cavalry April 1861. On 14 March 1863 he transferred to Company L, 1st Light Artillary Battery, Michigan. He mustered out 22 August 1865 in Jackson, Michigan. He started receiving his pension on 8 July 1892. In 1890 he was in Moorhead and in 1893 he was at the North Dakota State Disability Volunteer Soldiers Home in Lisbon, North Dakota. Peter was born 1828 in Pennsylvania. He joined Company D, 18th Wisconsin Infantry as an officer on 17 December 1861. He was promoted to 1st Lieutenant on 10 July 1863 and to Captain on 11 August 1863. He mustered out on 3 March 1865. Peter and his family lived in Moorhead with Peter serving at one time as Commander of L. H. Tenney Post No. 103, Grand Army of the Republic. Peter died on 19 December 1913 in Washington. He is buried in the Washington Veterans Home Cemetery in Kitsap County. Burial, Tombstone Picture, Portrait. Robert was born on 27 December 1836 in England. He enlisted as a Private in Company I 23rd Michigan Infantry on 16 August 1862. He was promoted to Full Corporal. He was discharged on 10 June 1865 in New York. He started drawing a pension on 19 August 1880 and his wife Elizabeth started drawing a widow's pension on 21 June 1906. Both pension applications were filed in Minnesota. In the 1890 Veterans Schedule he is living in Hawley. Robert died 20 April 1906 and is buried in Greenwood Cemetery at Park Rapids, Hubbard County. Burial, Tombstone Picture. John was born 1824 in Kent, England. He enlisted as a Private in Company I, 61st New York Infantry Regiment on 8 October 1864 from Shandaken, Ulster County, New York. He was discharged on 3 Jun 1865 in Washington, D. C. He started drawing a pension on 30 December 1890 in Minnesota. State census reports indicate he was a physician. His wife, Nancy Jane [sister to veteran James Sutherland], started receiving a widow's pension on 28 November 1898 in Minnesota. John died 30 October 1898 and is buried in Hawley Cemetery. Burial, Tombstone Picture. 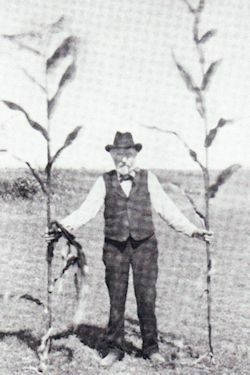 Biography from the "Compendium of History and Biography, 1902: "Adam Stein, one of the respected pioneers of northwest Minnesota, and a man of great energy and ability, resides on his farm in Georgetown township, and is known throughout Clay county as a citizen of worth and integrity. His portrait may be found upon another page of this volume (included herein). Mr. Stein was born in Bavaria February 8, 1821, and came to America in 1830. For a time he worked in Indiana and Kentucky, and steamboated on the Mississippi river for two years. He reached St. Paul in the year 1855 or 1856, where he worked at odd jobs for about three years. He became acquainted with Probstfield, who had just taken a trip to the Red River vally, and in June, 1859, our subject returned with him to the town site of Lafayette, on the Red River opposite the mouth of the Cheyenne. His first work there was to make hay. This he did with a scythe, and then with an improvised hay buck of poles and himself as a horse he made about ten tons of hay, which he sold to the Hudson's Bay Company for eighty dollars. He then worked for that company during the winter constructing a storehouse, which still stands on the old site of Georgetown. He passed the following winter on the farm in Oakport township. This farm was flooded out in the spring, and our subject started for St. Cloud, intending to leave the valley. At St. Cloud he learned that the farm which he now occupies had not been taken and he returned at once and secured the land, living there until the war broke out. He enlisted at Georgetown in December, 1861, and the following spring went south with Company G, Fourth Minnesota Volunteer Infantry, and was first engaged in battle at Iuka. This was followed by the battles of Corinth, Jackson, Champion Hill, and the second battle of Vicksburg. His health now failed, and he was sent with a convalescent squad to St. Louis. His next service was with Sherman�s army on its march to the sea. After over three years of service Mr. Stein was honorably discharged and was mustered out at Chicago. He made his way back to St. Cloud and remained there three and a half years until 1868, when he returned to his farm, after an absence of seven years. He conducted farming Operations, kept a ferry and run a hotel, and met with success. He is now the owner of eight hundred acres of land, five hundred of which are under cultivation. He has just completed a barn 60x60 feet, and in 1899 erected a fine residence. In politics Mr. Stein is a Populist, and is an advocate of reform in all lines of the public service. In his native land he was a revolutionist and fought for the principles of liberty, and now at the age of eighty years his mind is as active as in the days of his youth. He is a man of public spirit, of great energy and unquestioned integrity. Mr. Stein was married in 1866 to Miss Wilhelmina Schulz. Of this marriage eight children have been born, namely: William A., now register of deeds of Clay county; John M., deceased; Charles J., in charge of the home farm; Annie; Minnie, now Mrs. Stewart, of Sabin; Lena, deceased; Herman A., inventor of the �New Model" wind straw stacker; and Louise. He and his family are in the census for 1890, 1900, and 1910 as living in Georgetown. He was appointed Georgetown Postmaster on 22 June 1869. Adam donated one acre of land for the Wild Rose cemetery in Georgetown after his son, John M. Stein, was killed by lightning while mowing hay. This acre was to be divided, one half for the Protestant churches and the other half for the Catholic church. Adam died on 6 May 1911 and is buried in the Wild Rose Cemetery. Burial, Tombstone Picture. James was born on 21 September 1839 in Wayne, Kennebec County, Maine. He enlisted in Company F 11th Maine Infantry on 12 July 1862. He was promoted to Full Corporal. He was mustered out on 12 June 1865. He was a resident in the Hawley area from at least 1880 until his death. James died on 5 Jul 1910 in Hawley and is buried in the Hawley Cemetery. Burial, Tombstone Picture, More Info. His surname has a variety of spellings in records. Samuel was born June 1848 in Wisconsin. He enlisted in Company B, 38th Wisconsin Infantry on 31 March 1864 at Madison, Wisconsin. Due to a rupture he was medically discharged on 26 July 1865 at Washington, D. C. His family lived in Glyndon in 1910. Samuel died on 29 June 1931 in Olmstead County and is buried in Fennimore, Grant County, Wisconsin. Spencer was born 14 May 1834. He enlisted as a Private into Company A 5th New York Artillery Regiment from Hector, New York on 4 January 1864. He was mustered out on 10 May 1865 at Harpers Ferry, West Virginia. Spencer lived in Elmwood Township in 1885, Sabin in 1890, and Fargo in 1900. No other information could be found about him. James was born about 1844 in Nova Scotia, Canada. He enlisted as a Private in Company C 1st Maine Heavy Artillery Regiment on 5 January 1864. He was wounded on 19 May 1864 and discharged on 11 May 1865. He started drawing a pension on 19 May 1865. In 1880 he is living in Parke Township. In the 1890 Veterans Schedule he is living in Clay County. The U.S., Civil War Soldier Records and Profiles, 1861-1865 indicates he died in Rollag on 27 February 1900 and the 1879-1903 U. S. Records of Headstones Provided for Deceased Union Civil War Veterans indicates he died on 27 October 1900. He is buried in Hawley Cemetery. Burial, Tombstone Picture.